Current monitoring has never been easier, or more accurate using XB2x series current monitoring controllers. 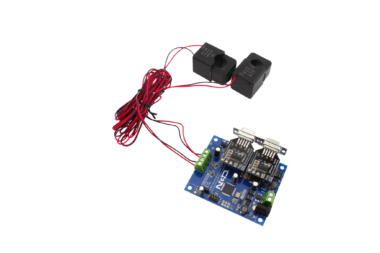 The XB2x series includes off-board current sensing, designed to safely clamp over a single high-current wire for current consumption measurement applications. When properly calibrated, up to 6 high-current loads can be monitored simultaneously with a maximum error rate of 2%. All XB2x series controllers include two communication ports compatible with our entire range of communication options, including Ethernet, Wi-Fi, Bluetooth, USB, or RS-232. 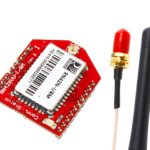 For long-range, high-speed wireless communications, use the second communication port for industrial wireless applications supporting the Digi 802.15.4 and Digi S3B DigiMesh® communications modules. This device provides an ideal energy monitoring solution for most industrial and commercial applications at a low cost with unmatched accuracy. Because we custom-build every controller, you have plenty of options. Simply choose the type of computer interface, the number of channels, type of sensor (split-core or solid-core), and your maximum current load (in amps). We will ship your controller pre-tested and pre-calibrated to 98% accuracy. When it comes to measuring a wide range of currents, there are many choices. In order to get the most accurate readings, you need to select exactly what you need and nothing more. 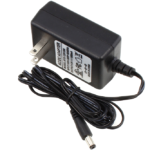 Don’t be alarmed to see a 100 amp sensor on our web site offered with a 10 Amp measurement range. We do this for the sole purpose of improving accuracy. The electronics and the firmware were tuned to operate in the 10-amp range. If you need to monitor a 10 amp circuit, you should choose a 10 amp controller (not a 20 amp controller). While there is no difference in cost, there is a significant difference in resolution. A 10-bit sensor reading across a 20-amp range will have HALF the resolution per bit as a 10 amp sensor. For this reason, and for the best possible resolution per bit, we offer many tuning ranges. You may have noticed we offer both split-core and solid-core sensor options. 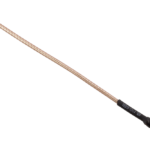 Solid-core sensors are ideal in applications where low-cost or tight spaces are required. Solid-core sensors are not able to clamp over existing wire; they require a wire to run through the sensor during installation of the wiring. Solid-core sensors are a great choice for new installations. Because the sensor does not “break apart” like a split-core sensor, it has a smaller size and a lower cost. For installations that must be retrofitted to add current monitoring, split-core sensors are our most popular choice. 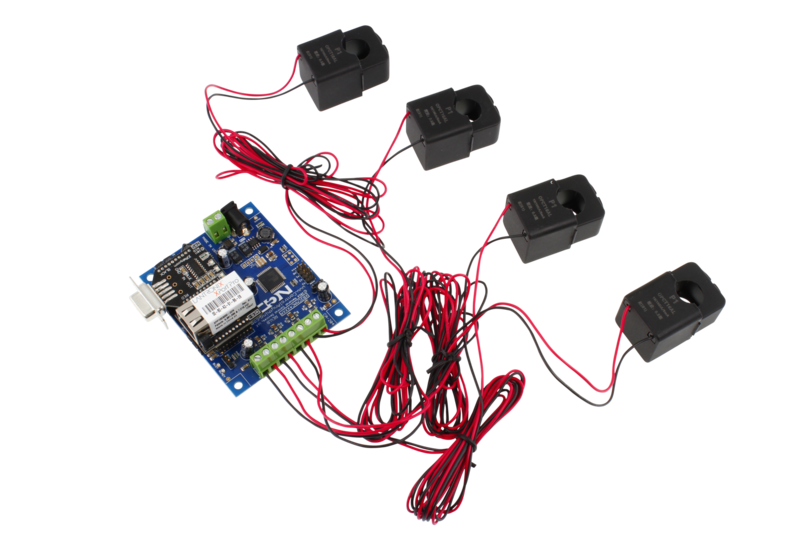 Split-core sensors can clamp over existing wiring by breaking apart the sensor and snapping it in place over the wire. 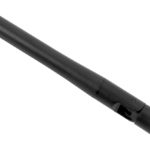 Split-core sensors are larger and more expensive, but the versatility and ease of connection make them extremely popular. Connecting sensors to a controller usually involves connecting two wires to the screw terminals of a controller. 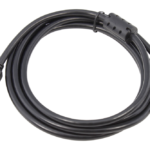 However, our SCT013 sensor includes a plug and a jack, reducing installation time. Unlike competing products, we do not gloss over the difficulties in monitoring highly inductive loads, such as motors, pumps, and other electrically noisy devices. We spent months developing algorithms that provide an excellent balance of speed and accuracy, whether you are monitoring resistive loads or inductive loads. Because of the difficulties in measuring inductive loads, our (free) Base Station software can be used to help fine-tune the calibration values to provide a more accurate measurement, further reducing the error rate to less than 2% for the most demanding loads. To get started quickly, use our free Base Station software. Base Station will have you monitoring energy in minutes, offering direct compatibility with your favorite communication technology (excluding Digi Wireless technologies). We highly recommend at least one USB interface in case you run into problems. Base Station and a USB interface can help get you connected fast! NCD Energy Monitoring controllers are designed with expandability in mind. 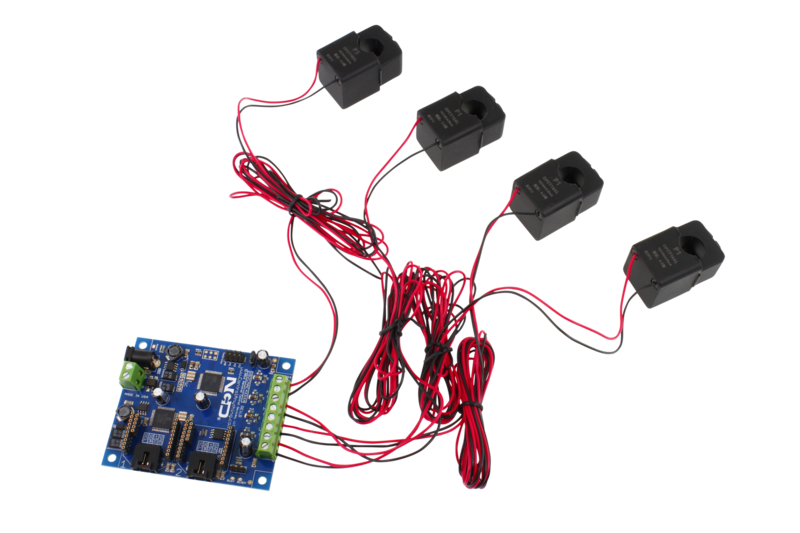 Each controller includes two on-board I2C expansion ports, making it easy to expand to our complete line of I2C sensors, FET controllers, PWM controllers, and I2C relay boards. 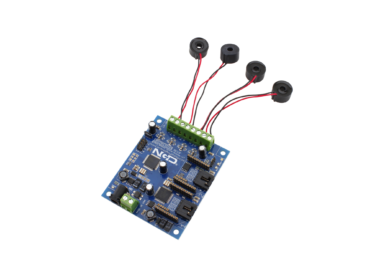 NCD Energy Monitoring controllers are rated for use with AC ONLY and will not work with DC loads. We have not yet completed 3-phase testing, but preliminary results are very hopeful. NCD Energy Monitoring controllers require 1.5 seconds to evaluate each channel. Therefore, a 6-channel controller will require 8 seconds to return a result for all channels. Sensors and controllers are designed to work together; it is NOT POSSIBLE to mix sensors to monitor different load sizes with a single controller. 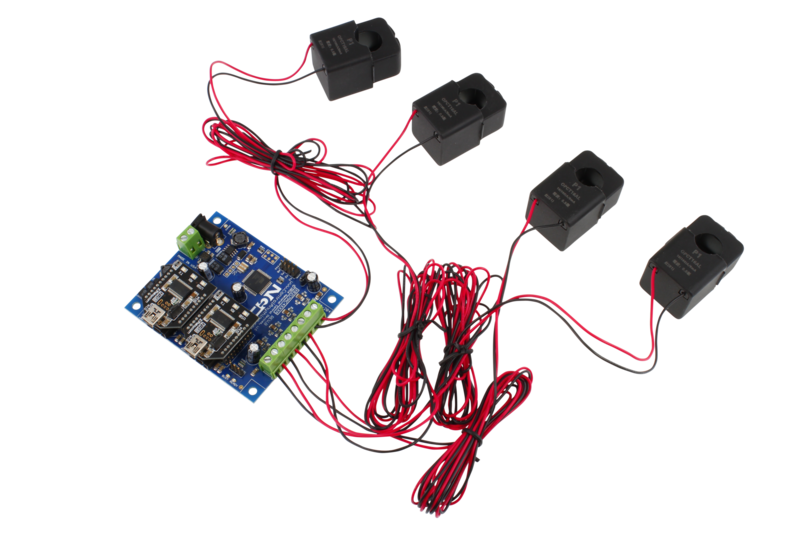 Mismatching sensors and controllers can result in permanent damage to the controller. 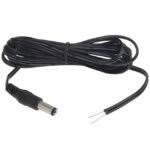 Users should avoid extending the cable of the current sensor as much as possible. Extending the wires may decrease accuracy. Our tuning electronics can accept up to 5% current above the rated range, exceeding 10 amps + 5% for an extended period of time may cause damage to the tuning electronics or the CPU on our controller. 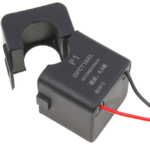 Off-board current sensors have a minimum load requirement of 1% of the total rating of the sensor. Failure to meet the minimum load requirements will significantly reduce accuracy. Please see minimum load requirements below. NCD current monitoring controllers support many communication options. With a dual interface, choose any two of your favorite communication technologies. Choose from USB, RS-232, Ethernet, WiFi, Industrial Wireless, or more. Use 802.15.4 Communications if you require industrial strength long-range wireless communications. 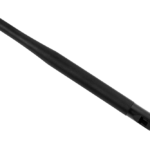 802.15.4 is a point-to-point wireless standard, allowing fast communications. The wireless protocol acts as a long-distance wireless serial port, allowing wireless operation with no modification to software. 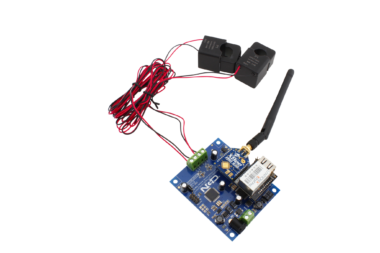 Bluetooth is a easy way to add wireless communications to the NCD Industrial product line. 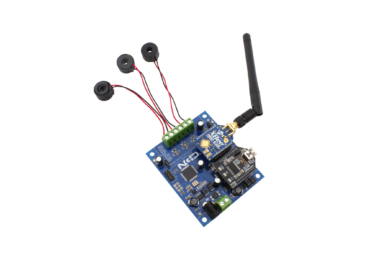 The Bluetooth communications option acts as a transparent serial port between your computer and NCD devices. Simply pair the device with your computer and access the device through the COM port that is associated with the Bluetooth communications module. Control NCD devices using standard Ethernet TCP/IP communications. Simply open a socket and send and receive TCP/IP data to control our devices. 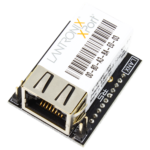 Our Ethernet TCP/IP Communication modules feature the Lantronix XPort communications module, the best in the industry. The Lantronix XPort module is an industrial workhorse that we have trusted for many years. NCD RS-232 Serial Communication modules make it easy to integrate the worlds most prolific communication standard. Easily interface to desktop PCs and laptops for easy control via standard serial commands. Most NCD devices typically default to 115.2K Baud; however, older low-cost devices implement 9600 baud data rate as the predominate standard. 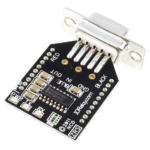 Our USB interface module makes it easy to control our devices using the USB port. 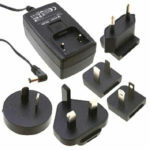 Simply plug into any available USB port and start controlling our devices using standard serial commands. 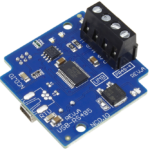 NCD USB Interface modules feature genuine FTDI USB to Serial Converter Chips, the very best in the industry. Control NCD devices using standard WiFi TCP/IP communications. Simply open a socket and send and receive TCP/IP data to control our devices. NCD WiFi communication modules are manufactured by Microchip, the world leader in microcontrollers. 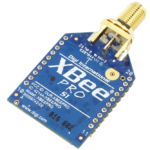 ZigBee® wireless communications is a popular standard among our customers. The wireless protocol acts as a long-distance wireless serial port, allowing wireless operation with no modification to software. When using an 802.15.4 communication module, it is essential that you use the ZIGMO_PCB to configure the module settings. A 802.15.4 Modem will also be required. The default pairing code for NCD Bluetooth devices is 1234. 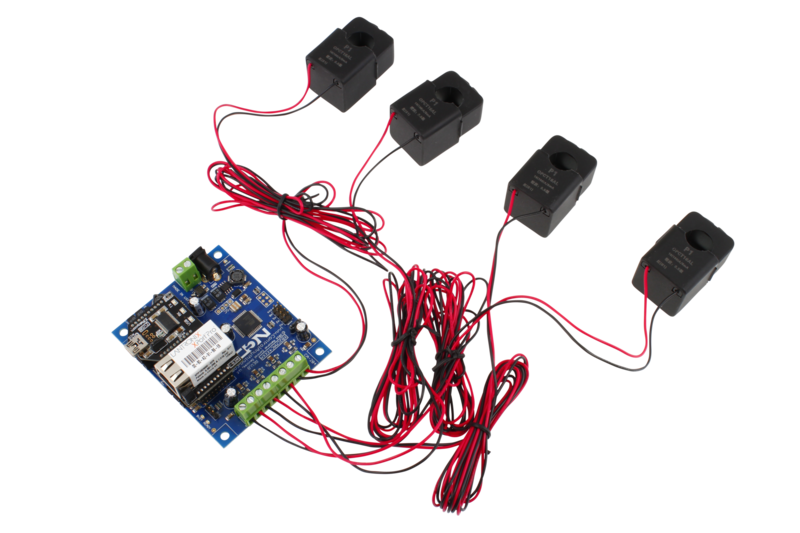 Users may change the pairing code and other settings, including encryption options, using the ZigMo_PCB, which will provide a USB interface for configuring settings inside the Bluetooth communications module. This device periodically sends UDP Packets on port 13,000, which help identify the IP address of this device on your network. This device sends UDP Packets to link.signalswitch.com to help users access this device from the internet (this feature can be disable). Remote access over the internet requires users to configure Port Forwarding on the router that is associated with the WiFi communications module. Port Forwarding is outside the scope of NCD technical support. Please visit PortForward.com for instructions on configuring most routers for port forwarding. 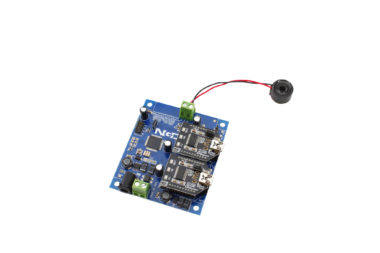 The NCD RS-232 Serial communications module is compatible with standard RS-232 signals (+/-10VDC), which are not directly compatible with UART signals from a microprocessor. If you are working with Arduino, Microchip PIC, or other common microcontroller, a communications module is not required. Microcontrollers will directly talk to the on-board processor of all NCD controllers. This device is compatible with USB communications, which will mount as a Virtual COM Port on your computer. All device functions will be accessed via the virtual com port using standard serial commands. The default baud rate is 115.2K Baud for most NCD devices. USB Drivers are included with most versions of Windows, but users of other operating systems may want to download the latest drivers directly from the FTDI web site. 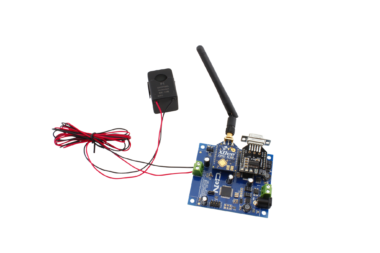 When using a WiFi communication module, it is essential that you use the ZIGMO_PCB to configure the WiFi network settings. This device periodically sends UDP Packets on port 13,000, which help identify the IP address of this device on your network. This device sends UDP Packets to link.signalswitch.com to help users access this device from the internet (this feature can be disable). Remote access over the internet requires users to configure Port Forwarding on the router that is associated with the WiFi communications module. Port Forwarding is outside the scope of NCD technical support. Please visit PortForward.com for instructions on configuring most routers for port forwarding. 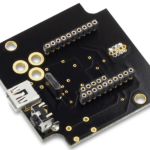 When using a ZigBee® communication module, it is essential that you use the ZIGMO_PCB to configure the module settings. A ZigBee Modem will also be required. The Wi-Fi Communications Module must be configured in order to connect to your network using the Wi-Fi Configuration Kit. 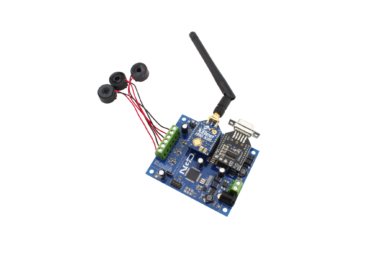 The Wi-Fi Configuration Kit consists of a small black board with 3 LEDs. The Configuration Board will be labeled ZIGMO. 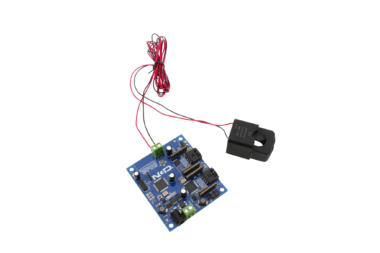 The module may have to be removed from the board and plugged into the ZIGMO as shown. The ZIGMO will plug into the USB port of your computer for configuration and some USB drivers may need to be installed on your computer. Base Station software is required to configure the Wi-Fi communications module and is available as a free download. This software identifies compatible Wi-Fi routers in your area and assigns the router you have chosen to the Wi-Fi communications module. Network security options may be configured using this software including passwords. You can find the NCD Base Station Software at ncd.io/start. This video will introduce you to Controlling Relays over your Local Area Network (LAN) using Ethernet Relay Controllers from store.ncd.io. Ethernet can be one of the more complicated communication interfaces due to the network protocol stack. We break it down for you to show you the most important parts for Relay Control. You can find NCD Base Station at ncd.io/start. 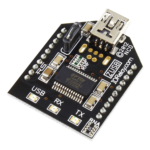 FT232RL USB Interface Adapter Similar to the Digi XBee ® footprint shown controlling a 16-Channel Relay Controller Board Available from https://store.ncd.io/product/usb-communications-module-ft232rl-zusb/ Drivers Available from FTDI: FT232RL USB Interface Adapter Similar to the Digi XBee ® footprint shown controlling a 16-Channel Relay Controller Board Available from https://store.ncd.io/product/usb-communications-module-ft232rl-zusb/ Drivers Available from FTDI: http://www.ftdichip.com/FTDrivers.htm Base Station Software: ncd.io/start Digi.com offers a wide variety of XBee Interface modules for industrial wireless applications. 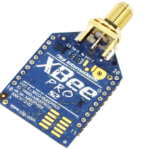 Digi XBee® devices are compatible with NCD products. 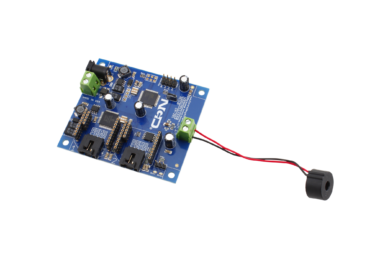 Learn how to set up you own ZUSB Module to work with your NCD Relay Controller. 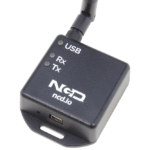 For complete instructions and details on how to use an NCD ZUSB Module see our article at https://ncd.io/zusb-usb-communications-module-quick-start-guide/ Portions of this video may be outdated as we have moved from controlanything.com since this video was created. A simple demonstration of the Wireless Range of 802.15.4 in the 300' and 1 Mile Range with and without obstacles. This video tells you the set up that we used to get real world ranges on our wireless communication modules. 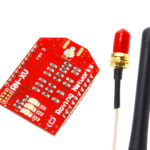 Introduction to our WiFi Module and technologies. Learn the advantages, disadvantages as well as tips and tricks for using WiFi Relay Controllers available from store.ncd.io. 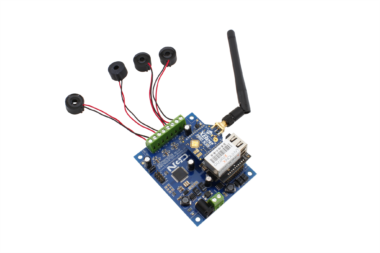 You can find more in depth information on how to use and configure your WiFi Relay Controller at https://ncd.io/wifi-module-quick-start-guide/. Learn how to communicate to your Ethernet Module using a Virtual COM Port. Virtual COM Port communications are ideal for existing applications that make use of our wired and wireless relay control already and want to quickly add support for Ethernet Relay Controllers. Virtual COM Port communication allow you to send commands to an Ethernet Relay Board as if it were directly connected to the controlling PC. Learn how to find the COM Port on your windows based computer. You can also use Base Station to find the COM Port of your Relay Controller. Base Station can be downloaded at ncd.io/start. Get the rundown on the pros and cons of all the Wired Communication Interfaces we offer. If you want to know which wired technology will best suit your needs this video will get you the information you need in just a few minutes. Whether you need the power of ethernet or the simplicity of RS-232 we have something to fit your application. 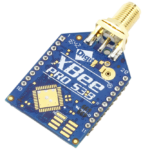 Use the USB Configuration Adapter if you want to change the settings inside the WiFi, Bluetooth, KFX Key Fob, and Wireless communication modules. You will need a Modem to talk to Wireless and RS-485 devices. You do not need any of these options if you will only communicate over an Ethernet, RS-232, or USB communication interface above.